The memorial takes the form of an oak Screen across the Tower Arch. 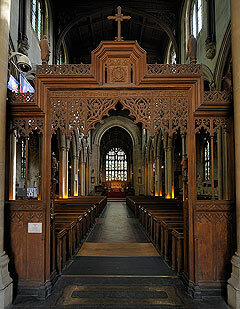 The Screen has a wide central compartment forming the entrance, the head being filled with pierced tracery and carved work; the compartment on either side have similar work in the heads with the lower part filled with solid panels. Above the entrance is a panel containing the Paschal Lamb (the Regimental badge) on the side facing the Church, and on the reverse side the Royal Cipher of Charles II. And Catherine of Braganza within the ribbon of the Garter; below these, the Regimental mottoes are carved in raised letters. Above the top line of the Screen on moulded pedestals are figures of the four Patron Saints – S. George, S. Andrew, S. David and S. Patrick. The opening is flanked on either side with carved buttresses on which stand small figures of an officer and man of the Regiment in service kit. The Memorial inscription forms a margin round the marble paved threshold and consists of a bronze plate with the lettering, etc., richly executed in white metal. 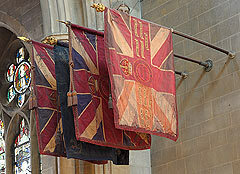 Above the screen are suspended the Colours of the 4th Battalion, The Queen's Royal Regiment (TA). The work was carried out from the designs of Mr. C. M. Oldrid Scott, Architect, the Screen and paving being the work of Mr. A. Robinson, of 4, Bennett’s Yard, Marsham Street, Westminster, while the inscription plate was by Messrs Blunt & Wray, 70, Salusbury Road, Kilburn. Dedication of the Memorial took place on the 5th November 1922 with the Lord Lieutenant of the County of Surrey, Colonel, The Right Honorable The Lord Ashcombe CB, TD in attendance. The Dedication was performed by The Venerable The Archdeacon of Canterbury, Canon LT White-Thomson MA and The Service was conducted by the Vicar, The Rev WPG McCormick DSO, MA, RD. The then Colonel of the Regiment, General Sir Charles C Monro GCMG, KCB, ADC and Lieutenant General Sir ER Elles GCIE, KCB were also present. 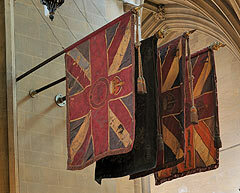 During the Service the Kings Colour of the 2/4th Battalion and the 3/4th Battalion were laid up. The two Commanding Officers’ being Colonel FD Watney CBE, TD DL and Lieutenant Colonel KA Oswald DSO. 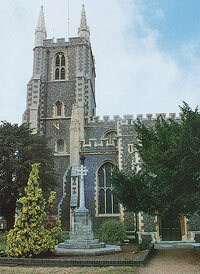 The Shrine was established in the Church through the dedication and drive of an ex-member of the 4th Bn The Queen’s Royal Regiment. Sgt Harry Mann and his brother served in the 2/4th Battalion through the Great War. In 1925 as a police officer he compiled a list of all members of the 2/4th Battalion and became Secretary of their association. He was awarded the MBE in 1976 for his services to the association. The battalion was formed in 1859 as the 2nd Surrey Rifle Volunteer Corps, its members being drawn from the Croyden, Crystal Palace and Caterham areas. Redesignation as the 1st Volunteer Battalion, Queen’s Regiment was in 1883 and 1900 a number of volunteers served with the regular 2nd Battalion in South Africa. As the 1/4th Queen’s and part of the 44th (Home Counties) Division, the battalion sailed for India in October 1914. Before returning home it sent a draft to Mesopotamia, where it saw action, and in 1919 took part in the Third Afghan War. Of the three additional battalions formed by the 4th for war service, the 2/4th saw action with the 53rd (Welsh) Division at Gallipoli, Egypt and Palestine. It later joined the 34th Division and fought in France and Belgium. The 3/4th also went to France, while the 4/4th, later, 4th (Reserve) Battalion remained at home with the Home Counties Reserve Brigade. In 1938 the battalion was converted to an anti-aircraft role and in 1940 transferred to the Royal Artillery as 63rd Searchlight Regiment. After several changes in role and designation the battalion became infantry again in 1961. 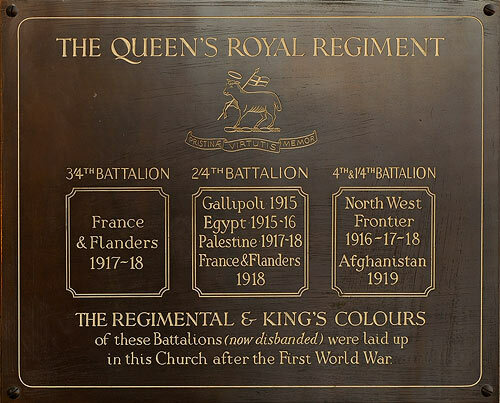 It was amalgamated with the 5th and 6th Battalions, Queen’s to from the 3rd Battalion, The Queen’s Royal Surrey Regiment. be seen on either side of the carving. 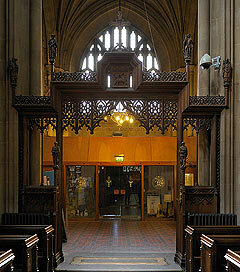 Between the tower of the church and the nave is a carved oak screen which forms a memorial to the officers and men of the 4th Bn The Queen’s Royal West Surrey Regiment. 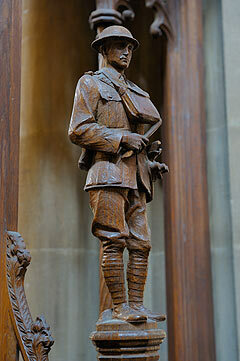 Carving of an officer in the uniform of the Great War. 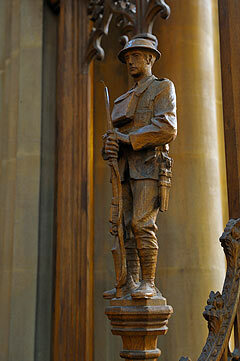 Carving of a soldier of the Great War period with rifle and steel helmet.. These are situated high up on the wall of the tower as you enter the church on the right. copper-plate writing and is framed behind glass. British guests at the ceremonies included General Forrester’s two sons, Simon and Nicholas, and his grandsons, Nick and James (the English and Gloucester rugby player), as well as General Forrester’s companion in later years Mrs Denise Patterson. Consul-General in Naples and Southern Italy, were amongst a party from the British diplomatic staff in Italy.